Here’s some good news to start the new year: some Muslims are publicly and pointedly making fun of ISIS, the murderous, beheading terrorist organization that wants to establish a caliphate in the Middle East. You can read the translated statements and the reactions here. Why is this encouraging and significant? Because while military action is obviously needed to defeat the ISIS forces on the ground, the only sure way to really defeat radical Islamic terrorism long-term is to cut it off at its roots, by having Muslims everywhere reject the evil ISIS represents and thereby deprive the group of new recruits. And when ISIS is trying to present itself as a formidable and intimidating force that represents the true Islamic faith, public mockery is a pretty effective weapon. When an act of radical Islamic terrorism occurs, people often wonder why moderate Muslim religious leaders don’t publicly condemn the actions and the killing of innocents. I’m not sure why the religious leaders aren’t more vocal, but it’s good to see that, in the world of social media, Muslims are speaking out and puncturing the titanic ISIS pretensions with humor. I tend to be suspicious when people start invoking God as directing their actions. Whether it’s sports figures suggesting that God cares about the results of a silly game, or politicians suggesting that God favored them over their opponent, or people who presume they know what God would want to be published on a billboard or a bumper sticker . . . well, color me skeptical. Dzhokhar Tsarnaev, one of the Boston Marathon bombers, has taken the God notion to new levels. He apparently thought that God — and his dead brother — were with him as he huddled in a boat in somebody’s back yard, hoping to avoid capture for his criminal killing and maiming of entirely innocent civilians who participated in the Boston Marathon. A note that he wrote on that night says it was God’s plan for him to hide in a boat and “shed some light on our actions.” Tsarnaev also said that Muslims are “one body” and if you “hurt one, you hurt us all.” Yeah, right! Nice try, Dzhokhar! If there is a God, could he actually have carefully plotted out Dzhokhar’s descent into terrorism and the series of sociopathic decisions that ultimately placed him under a tarp in a boat, hoping he wouldn’t be found? Sorry, Dzhokhar, I don’t think the Almighty is troubled by you, personally, or your little trivialities — so you’re going to have to accept personal responsibility for your murderous actions. As as for having the opportunity to “shed some light on our actions,” you don’t need God for that — hopefully the American justice system will serve. I’ll be interested in hearing why you don’t think you’re to blame. The Muslim world has been giving the United States a lot of advice and information lately. No doubt we’ll hear more thoughtful recommendations and guidance in the next few days, as Muslim leaders come to New York for a meeting of the U.N. General Assembly. America needs to decide how to respond. In Egypt — where only days ago raging mobs stormed the U.S. embassy and ripped down our flag — the new President, Mohamed Morsi, says in an interview with the New York Times that the United States needs to fundamentally change its approach to the Muslim world and show greater respect for Muslim values. In the meantime, the head of the largest fundamentalist Islamic party in Egypt, which supported Morsi, is calling for U.N. to act to “criminalize contempt of Islam as a religion and its Prophet.” And in Pakistan — a supposed ally — the government Railways Minister has offered a $100,000 payment to whomever kills the makers of the YouTube video The Innocence of Muslims and called upon al Qaeda and the Taliban to help in murdering the videomakers. (Fortunately, the Pakistani government says it “absolutely disassociates” itself with the comments of its Railway Minister. Thank goodness!) And we haven’t even heard yet from the likes of Mahmoud Ahmadinejad, who will be speaking to the U.N. General Assembly, too. It’s heartening to hear from the enlightened leaders of a region that is widely recognized for reasoned discourse and thoughtful consideration of opposing viewpoints. But I’d like to see whoever speaks for America at the U.N. General Assembly share some of our views with the assembled Islamic leaders — and do so in pointed terms. We should say that we relish our First Amendment, and we’re not going to change it no matter how often Muslims go on murderous rampages at some perceived slight. We should say that will fight any effort to criminalize speech and will veto any ill-advised U.N. resolution that attempts to do so. 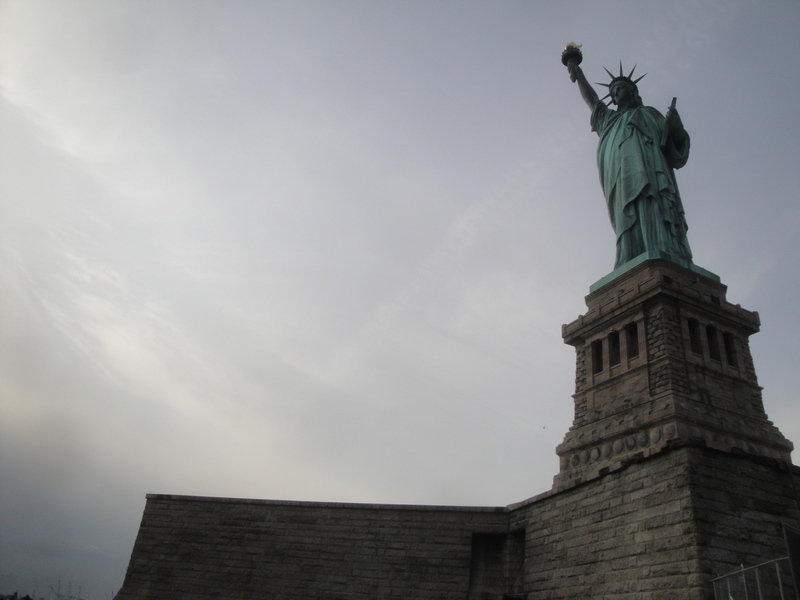 We should emphasize that we think that the world needs more freedom, not less, and that we stand with the forces of liberty. We should tell the Muslim leaders that their real problems are not with freedom of speech and freedom of religion, but with tribal-based, anti-female societies that crush individual initiative, medieval economies that leave huge swathes of the population unemployed and ready to riot at any moment, and corrupt leaders who are more interested in amassing their own fortunes than helping their people realize a better way of life. Oh, and we should make clear that we won’t do business with government where ministers are offering bounties on the heads of filmmakers. I’m tired of our simpering, whimpering approach to defending our fundamental freedoms. It’s high time that we stood up for what we believe in and told the Islamic world that they can riot all they want: we aren’t going to back away from our liberties. Is It Really All About A Movie? 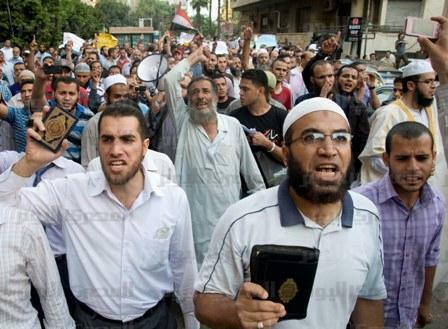 Is the rioting and embassy-storming really just the product of Muslim rage at an incendiary video? Mounting evidence suggests that the Administration story line is just wishful thinking. The carefully coordinated, well-armed attack on the poorly defended U.S. consulate in Benghazi doesn’t seem like the spontaneous response of Libyans to a video, but rather a pre-planned terrorist act. A writer for the Jerusalem Post argues — persuasively, in my view — that much larger forces than offensive videos are at play and that American foreign policy seems to be based on imaginative fictions rather than reality. 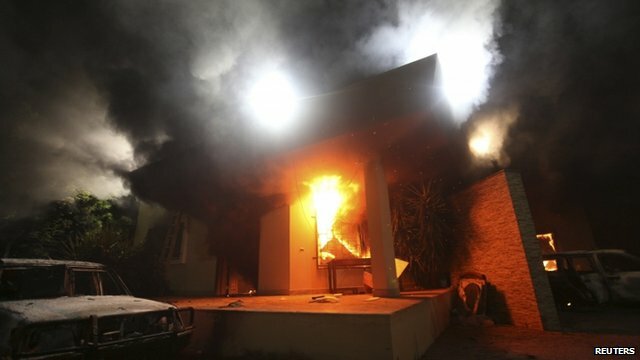 The Obama Administration needs to take a careful look at what really happened in Benghazi and Cairo and what is really motivating the people who brought heavy weapons to the U.S. consulate in Benghazi and seemed to good intelligence about where the American Ambassador was staying and where he would be moved. Now is not a time for phony spin or false bravado. Foreign policy isn’t a game; the lives of American diplomats, their families, and their staff demand a clear-eyed, careful appraisal of reality. Perhaps it’s time to stop hunting for video makers and start looking for an effective way to deal with a so-called “Arab spring” that appears to have morphed into anti-American totalitarianism. During this presidential campaign, Americans have focused on our troubled economy and other domestic problems. Yesterday, we were rudely reminded, yet again, that there is a big, unfriendly world outside our borders. On the anniversary of 9/11 — of all days! — an Egyptian mob stormed the walls of the U.S. embassy in Cairo, tore down the American flag, and raised instead a black flag like that used by al Qaida that read: “There is no God but Allah and Mohammad is his messenger.” Hours later, in Benghazi, Libya, militiamen attacked a U.S. consulate, firing shots, throwing homemade bombs, and killing a U.S. State Department official and wounding another American. In both cases the attacks were said to be provoked by a low-budget film about Mohammad produced by an American that Muslims consider offensive to Islam. On the day of the Cairo attack, the U.S. Embassy there issued a curious statement that said: “The Embassy of the United States in Cairo condemns the continuing efforts by misguided individuals to hurt the religious feelings of Muslims – as we condemn efforts to offend believers of all religions. Today, the 11th anniversary of the September 11, 2001 terrorist attacks on the United States, Americans are honoring our patriots and those who serve our nation as the fitting response to the enemies of democracy. Respect for religious beliefs is a cornerstone of American democracy. We firmly reject the actions by those who abuse the universal right of free speech to hurt the religious beliefs of others.” The statement was condemned by many as a mealy-mouthed apology to Muslims, and the Obama Administration later indicated that the statement was not cleared and does not reflect the Administration’s views. The United States has poured billions of dollars into the Middle East — Egypt has for years been one of the largest recipients of American aid — and supported the “Arab Spring” uprising in Libya with military assistance. All of that is forgotten, of course, when some unknown movie supposedly bruises the tender religious sensibilities of fringe elements of the Islamic faith, and their grossly disproportionate response is to physically attack official American installations and kill an innocent diplomat who had nothing to do with the offensive film. And, amidst it all, our embassy personnel think it appropriate to “condemn the continuing efforts by misguided individuals to hurt the religious feelings of Muslims” and to invoke 9/11 in doing so? What “continuing efforts” are they talking about, by the way? Doesn’t that statement send an appalling message of weakness to the radicals who mean to do us harm? Edited to Add: The assault on the American consulate in Benghazi was even worse than first reported. Four Americans were killed, including the American Ambassador to Libya, J. Christopher Stevens, and two Marines who tried to defend the consulate against the attack.